The mourners made their way to the white grave marker one by one to pay their respects to a man long gone, and still missing — but not forgotten. Marianne Graf Thomas remained motionless for a moment, clutching a folded American flag to her chest, her eyes fixed upon the name etched in the tombstone: Albert Stephen Graf, First Lieutenant. Forty years ago, the Bogota native was shot down in an F-4B Phantom II above a Vietnamese jungle. On Tuesday, he was honored with a full military funeral at Arlington National Cemetery, as those who loved him paid tribute to a man whose irrepressible optimism and indomitable will remain undimmed by the passing decades. “I feel like a cocoon that has been wrapped so tightly, and now the cocoon has opened, and I get to be a butterfly,” Graf Thomas, his widow, said. One thing has always eluded his family and friends however: a body to mourn. There is no grave underneath the marker. The remains of Graf, 24, a radio intercept officer, and Jerry Zimmer, a 25-year-old pilot from upstate New York, were never recovered. All hope of finding them appeared lost forever — until now. Thanks to the efforts of Graf Thomas and Elaine Zimmer Davis, Zimmer’s widow, the military agency assigned the task of locating missing American servicemen and servicewomen has reopened their case and sent an investigative team to what is believed to be the crash site in search of their remains, Zimmer Davis said. Graf Thomas still remembers the day that a black car pulled into her driveway bringing the news of her husband’s presumed death. But last year, when Graf Thomas visited Vietnam with an experienced tour guide, retired Marine Bob Burke, it became clear that the original coordinates did not match the crash site described in the 1993 report that declared the Zimmer/Graf case in the “No Further Pursuit” category, Zimmer Davis explained. Burke’s expertise in the local topography led him to conclude that the crash site was elsewhere. With the help of a declassified report written days after the crash, Burke determined that the site was actually 6,000 meters — about 3½ miles — from the place where it was previously thought to be, she said. Earlier this year, Zimmer Davis and an old friend and former Marine comrade of her husband, Gene Mares, traveled to Vietnam as well. Though Zimmer Davis was forced to turn back during the arduous hike through thick vegetation and 100-degree heat, Mares was able to make it to what they believe is the crash site. He and their Vietnamese guide — a former Viet Cong — recovered half a dozen pieces of a jet. Zimmer Davis’ husband, Ron Davis, also a retired Marine, sent pictures of the debris to a network of Marine plane experts, who concluded that five of the six pieces belonged to an F-4B Phantom II. No other F-4Bs were shot down in the area, said Zimmer Davis, who lives in San Diego. Combined with Burke’s analysis, the findings were enough to persuade the Joint POW-MIA Accounting Command to reopen the case and send a team to the site, she said. The results of that team’s visit are not yet known. Officials at JPAC did not return calls for comment, and a spokeswoman said she did not have any information to release regarding the case. Zimmer received his own full military funeral service at Arlington a few weeks ago, nine days before the 40th anniversary of the Aug. 29, 1969, crash. His marker stands beside Graf’s in a section of the cemetery dedicated to those still missing. Gunnery Sergeant William Dixon, the Marine Corps funeral director for Arlington and for the Washington region, said many families are not aware that they are entitled to a full honors service if their relatives’ bodies were not recovered. “It’s a blessing for those families to have some closure,” he said. Tuesday’s ceremony — which took place on what would have been Graf’s 65th birthday — drew some of his closest friends, who reminisced about a man whose name is still known in Bogota. The bridge along Main Street bears his name, as does an annual cross-country award at Bogota High School, where Graf was a standout in track. There was Rusty McInerney, who roomed with Graf in flight school and recalled their lives as carefree, confident young men. Graf bought a Pontiac GTO, McInerney a Corvette, and the two friends would chat up single ladies at the local bars. There was Bernie Fowler, who ran track with Graf at Bogota High and remembered Graf’s infectious smile. There was Dave Ells, Graf’s childhood friend, who helped organize the ceremony Tuesday and was happy to be around to see this day. He suffers from emphysema and was given three to five years to live. That was 10 years ago. But most of all, there was Marianne Graf Thomas, who may finally have found the healing she has awaited for 40 years — even if she never has a chance to bury her late husband’s body. A man in a yellow ball cap watched as the woman searched for a name on the Vietnam Veterans Memorial Wall in Washington, D.C. a few days ago. She held tightly to the telling, tri-folded American flag, and he knew. "Can I help you?" he asked, and Marianne Graf Thomas told him she was looking for Lieutenant Albert Graf. The park volunteer found the name, too high on one section of the wall for Thomas to see among the more than 58,000 names of men and women who were killed in the Vietnam War. "Would you like for me to get a rubbing?" he asked, and he retrieved a ladder and made one of the engraved words, a symbol of the 24-year-old Marine who'd married a young St. Marys woman and never came back to her. He was lost 40 years ago in rugged terrain over central Vietnam when his F-4 Phantom was shot down. Thomas, who feels more passion than most for today's National POW-MIA Recognition Day, carried the folded flag she'd received September 8, 2009, in Arlington National Cemetery as the widow of Lieutenant Graf, who's listed as missing in action. He's among about 1,800 service members who were prisoners of war or are missing in action. The radar intercept officer was honored with a memorial service and a memorial marker in a special section of the cemetery for military personnel whose remains have not been recovered. "If you wear this yellow hat," the volunteer said quietly, "you can climb the ladder and touch his name." He helped her up the ladder. Grief washed over her anew as her finger tips fit into the carved letters, grief for their lost youth and the family they never had, the dreams shattered, the bundled-up sadness that she kept to herself. "We met in Glynco Naval Air Station in Brunswick," Thomas said. "He was going through training and I worked as a clerk with the Georgia State Employment Service." They married, he a philosophy major from Bogota, New Jersey, who joined the Marines, and she a rural Southerner. They moved to Beaufort, South Carolina, for more training and his assignment to a squadron of F-4B Phantom fighter-attack aircraft with orders for Vietnam. Thomas came home to St. Marys to wait. On August 28, 1969, he wrote her a letter from his air base in Da Nang on the central coast of Vietnam. "He wrote that he and his squadron had a wonderful day," Thomas said. "They had been down to the beach on the South China Sea and played volleyball, drank beer. They had a lobster dinner that night, and he said 'there would be many dinners ahead for us.' "
On Aug. 29, Graf and his pilot, Jerry Zimmer, a 25-year-old from upstate New York, were the lead aircraft in Squadron VMFA 542 to fly into a hot spot south of Da Nang to clear the area for some advancing Marines on the ground. "They would fly low like crop dusters and drop their ordnance and go straight up," Thomas said. "They had full weaponry and napalm on the plane." Thomas understands from battlefield reports that the plane was hit by heavy machine gun fire from the ground. "There was no time to eject. The plane was gone in a moment," she said. The wreckage atop a mountain spread the length of two football fields, she said. Marines advanced to the site soon after but found no debris larger than a 2-foot chunk of metal, she said. "No one could have survived." Thomas later remarried, lost contact with Graf's family and worked in pre-school education before coming back home to St. Marys, single again, where she opened a restaurant and published a cookbook. "I never stopped thinking about Al, and I always knew some day I would go to Vietnam," she said. Several years ago, a couple who had been coming in to her restaurant on their way south each winter, told her they were from New Jersey. They talked casually and Thomas said she got a mental image of Graf's mother's garden just before the touring wife asked, "Do you know Rick Graf? He had a brother lost in Vietnam." She had worked with Rick Graf for 20 years. The moment triggered memories that came rolling in. Thomas reconnected with the Graf family and made plans to go to Vietnam to search for her husband's crash site. In August of 2008, she hired former retired Marine Bob Burke with Vietnam Battlefield Tours to help lead her to the area of her husband's last mission. She also traveled to Hanoi and met with Detachment 2 of the Joint POW-MIA Accounting Command and asked them to reopen Graf's case. 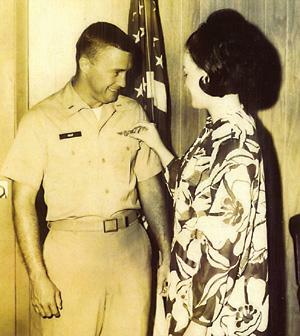 She and Burke went to the Da Nang area and hiked up one side of the mountain over which her husband's aircraft was lost but could not get through the rough terrain to the crash location. With her was another couple looking for a similar site where a family member had been lost. This August, she returned, again led by Burke, and accompanied by the same couple plus several of their young family members who wanted to help Thomas. They approached from another side of the mountain, using coordinates from military reports. "We ended up climbing 6- to 9-foot boulders in 100-degree-heat," she said. "We were in there for five hours." It was dangerous and more rigorous than she and some others in the group could handle. "But we could see the site, over a ridge." Two of the group got a bit closer and erected a small bamboo cross with a U.S. flag attached. Thomas said she decided then that it was not the destination that was so important to her. "It was the journey. And the place was beautiful. If his remains are never repatriated, it's all right. I'm at peace with that. I know where he is." She collected some sand and a perfect shell from the beach where her husband spent his last relaxing day. Shortly before her return this summer to Vietnam, Thomas had to give up her restaurant business. The recession hit home for her, and her upscale restaurant inside a historic district home that she restored, went into foreclosure. She said she also lost her personal residence in the financial unraveling. "It's not all bad. That restored building will stand tall for the next hundred years. And, as bad as this summer has been," she said, "I'm the luckiest person I know." Her search for Lieutenant Al Graf's last journey has created a new one for her, opening doors to new friends, reunions with his family, and a sense of finally taking care of the frightened, lost 20-year-old she was in 1969. There's a rightness to her world with the restoration and tributes to her husband's memory. 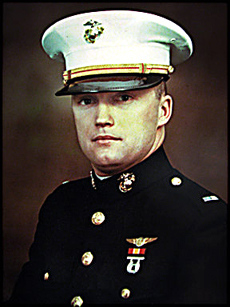 On September 8, 2009, Thomas sat with Al Graf's siblings in Arlington National Cemetery while Marines conducted a formal service for him. On October 18, 2009, she will go back to his hometown in Bogota to take part in an American Legion ceremony in which a black granite marker will be installed to honor him and another native son who died in the war. She learned that Al Graf was very popular in the small community, which named a bridge after him and talks of his ability as a high school track star and wrestler. "Any time there is sharing, there is healing," Thomas said. "As strong as my grief has been, the healing that's come after is stronger."